I began making a list of route options in Panther Gorge during 2013. The list grew larger over the years but specific lines floated to the top based on aesthetics, length, reliability, and other factors. We crossed many off when we climbed them or as we ruled them out as undesirable options. Our target for this trip was high on my priority list and a line that remained elusive after two years of attempts. 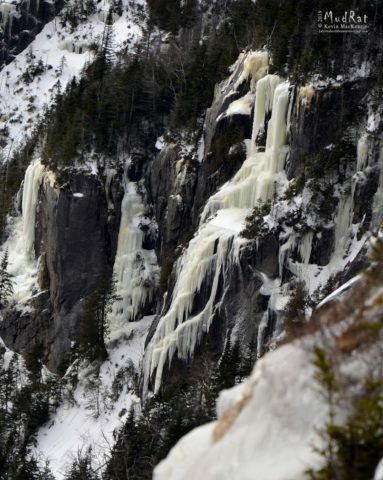 It is located deep within the Gorge near Grand Central Slide, the bottom curtain rarely touches down, and the thin layer of ice above the curtain quickly rots in the sun on the dark anorthosite rock of the cliff. 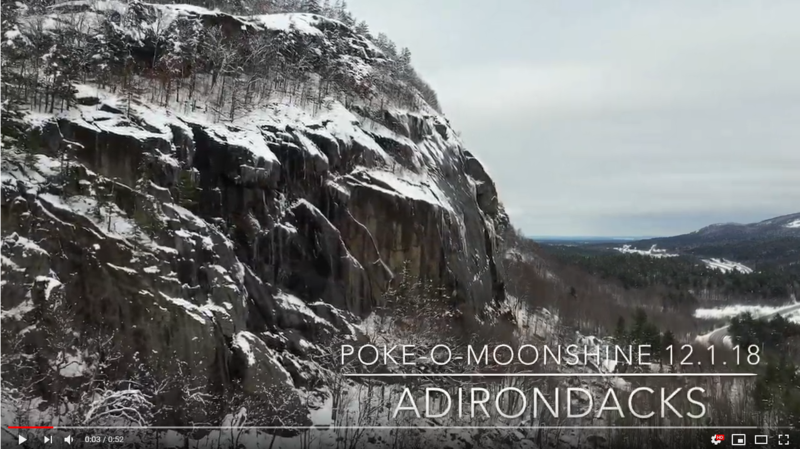 Jaryn DeShane and I attempted it in February of 2018 but ended up climbing a nearby route instead since it’s bottom was brittle, delaminated, and thin. I slept through my 3:15 a.m. alarm. My friend and partner in alpine starts, Alan, spent the night on January 4th. This was a blessing in disguise. I rarely sleep through alarms, but I did this time. After calling my name several times at 3:30 a.m., he gently kicked the bed. I jumped up like my head was on fire and readied myself. 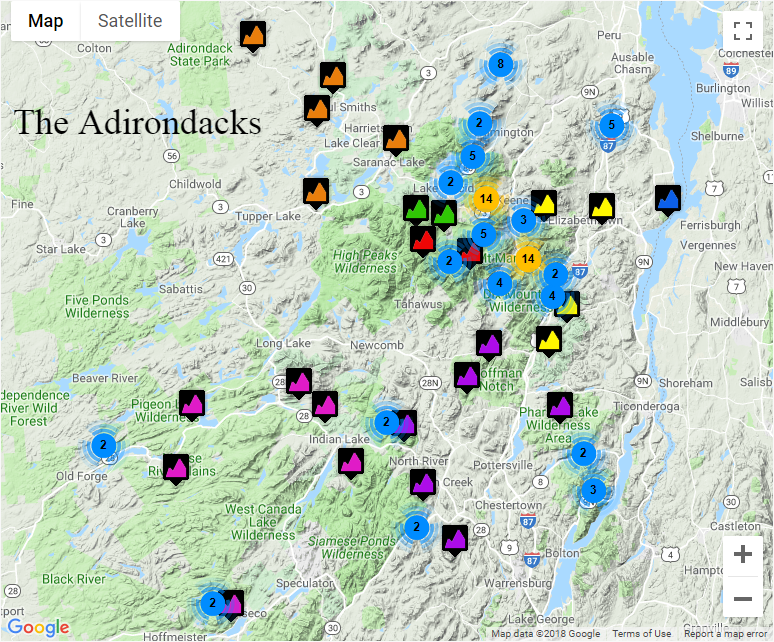 We stepped out the door and were on our way to meet Aaron Courain at the Adirondack Loj trailhead twenty minutes later. Most of our trips begin from Keene Valley, but the deeper targets are easier to access from the Loj via the Van Hoevenberg Trail as long as I remember the off-trail navigational details. The trail had little snow on it most of the way to Marcy Dam as our trio headed out, but the snow-pack grew as we gained elevation. Indian Falls marked the point where it was what I’d consider normal for this time of year. We walked under the light of headlamps for nearly three hours. The early morning vistas were beautiful as we approached Marcy. The mountains wore shrouds of dark blue which contrasted against the snow-covered slide tracks. Alan and Kevin descending into Panther Gorge along the Chimney Wall. We finally arrived at the jumping-off point from the Van Hoevenberg Trail at 9:15 a.m. on the Northeast ridge of Mt. Marcy, four and a half hours after leaving the cars. The snow-pack was bulletproof, and we enjoyed clear weather with line-of-sight navigation—much different from last winter’s descent. The ridge harbors thick krummholz, so walking atop the rain crust was a blessing that saved energy compared to the usual snow-slogs. Dense growth eventually loosened as the slope steepened below us. 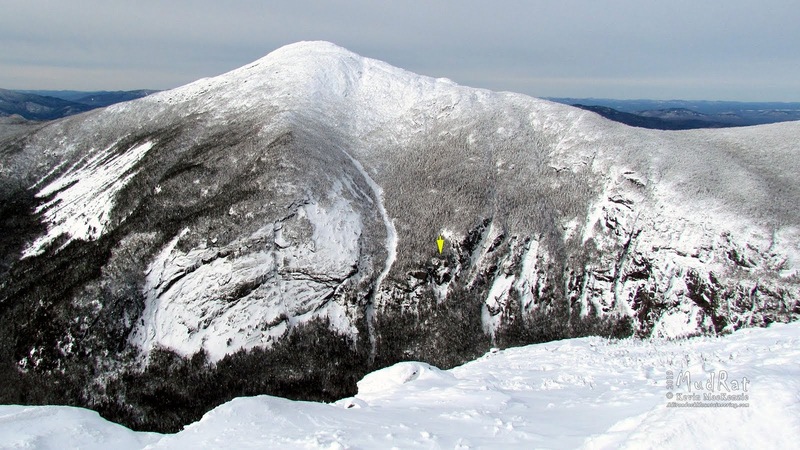 We glissaded, walked, and tumbled down the various glades and gullies until we reached our access point at the top of the gully below the Chimney Wall, home of Marcy’s vertical trap dike. As usual, the gully had been swept by a small avalanche. We changed into crampons and descended under fangs of wind-contorted yellow icicles and small roofs of stone. Our front-points bit into the crust and occasional ice bulges until we reached Marcy’s Great Chimney. I looked up, and the top was fat with ice. Another hundred feet of walking brought us below Panther’s Pinnacle rock climb (5.9) and an overlook of our intended quarry. I saw pillars of blue ice at the top and breathed a sigh of relief. Perhaps, I’d assessed the weather correctly. A quick down-climb led to the base of the cliff where my heart sank. I sighed, “Yup,” and kept studying the ice. A 20-foot section had recently snapped off and fallen down the glade. I picked up a plate of the 2-inch thick ice. It broke easily. As Aaron noted, it was rotten. 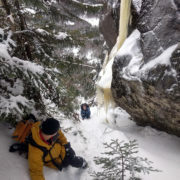 There were a couple of seams where rock gear might protect the start, but it seemed likely that a crampon or tool strike in the wrong place would bring the house down on us. It wasn’t worth the risk. I walked up the left-hand slope and spied another option. Some of the ice was delaminated, but patches looked solid enough to chance it. With luck, it would lead to the ramp. The alternate start looked fun in any case, so I opted to give it a try. Alan belayed while Aaron took photos with his phone. It was the only camera that found its way into the backpacks, but that’s another story. I stepped onto the ice. It was better than I expected. I had to chip the rotten surface away to place screws, but the underlying ice was firm. Higher, a yellow alien protected me. I wriggled up through a chimney on a ledge and stepped in front of a huge ice bulge. A final sketchy traverse led to the wall below the pillars. 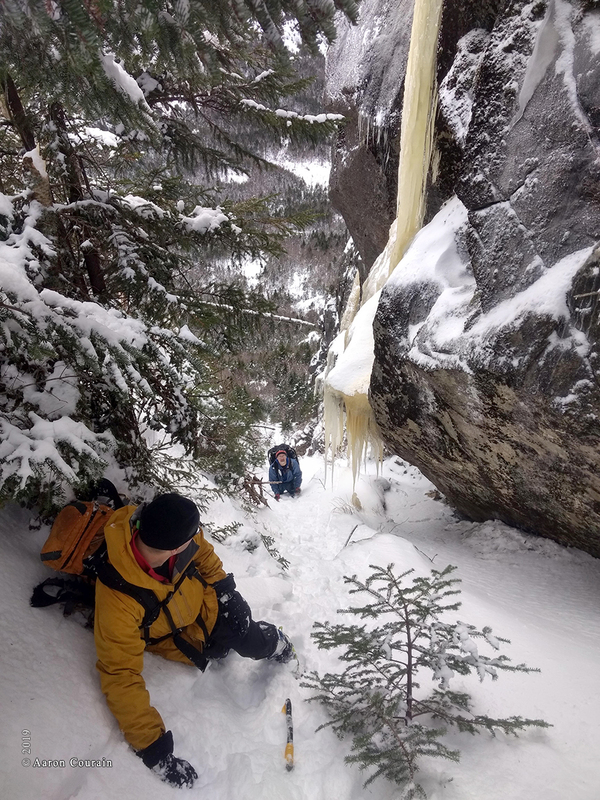 I poked around to find suitable ice for an anchor and avoided creating a belay directly below two hanging swords of ice. The recent rains had carved a channel through one of them. They’d both touch down in time. The color of the ice was a surprise. Most of it was blue, but several photos from recent years showed this area loaded with yellow ice. I scratched at the surfaces facing the sun—it was much like scratching a snow-cone. The ice in the shadows, however, was clear and solid. Meanwhile, the sun was battering the routes to the north. Pops, cracks, and the hissing sound of ice sheets sliding on stone echoed off Mt. Haystack. Most of the noise was coming from the Agharta Wall. Such sounds do nothing to bolster confidence when one is attached to a frozen wall nine miles from the trailhead. I expected the ice on the ramp below our terrace to calve off at any moment. Thin clouds intermittently drifted over the sun and cut its warmth. I prayed that it would become more overcast. Alan followed first, then Aaron. It didn’t take them long to reach my position. Alan and I have done plenty of leading in the Gorge, so Aaron volunteered to lead the crux. 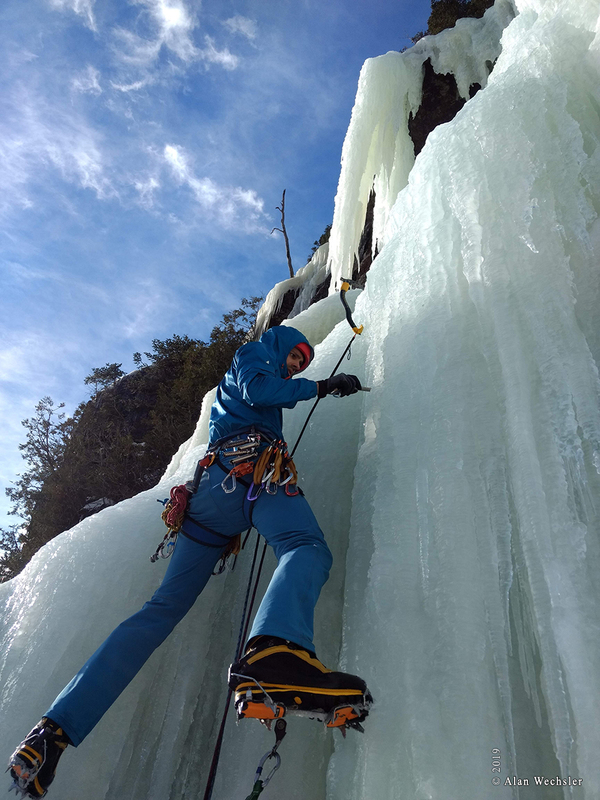 Crampons and tools easily bit into the soft ice which made the lead more of a pleasure than a battle as it would have been on the usual dry “bullet ice” of Mt. Marcy. I looked up into the “U” shaped cavity between the dripping pillars. They looked like angel wings. Most of the ice looked appealing, but some appeared whitish and aerated. It wasn’t long before Aaron was stemming up the last steep run. He yelled, “Turf!” when he reached the top and buried a tool in frozen soil. A loud hoot sounded quickly after. His enthusiasm was contagious. Alan climbed next, casting small bits of ice down around me as he kicked into the wall. His departure left me to take photographs and enjoy the peaceful setting. Distant voices on Haystack’s summit sounded close without wind sweeping through the Gorge. The route was much as I expected once I started climbing, though the vertical sections were longer than they looked from below—typical foreshortening. It only took a swing or two to find a good axe placement as opposed to the multiple strikes it took to procure a safe stick while leading Spiritus Draconis last year. I love this type of ice—a rare treat up this high. The cavity between the pillars seemed to swallow me as I stepped into it and looked up the final wall. The thought struck me that I was nearing the completion of a two-year-old dream. I was consumed by the peace of the moment and appreciated each second of the climb. My smiling companions greeted me at the top. They were standing on a few feet of snow, attached to a large balsam. I felt a surge of accomplishment and a little relief that the long approach trip had worked out. The sting of previous failed attempts faded and made the climb that much more meaningful. Alan asked if I had a name in mind. 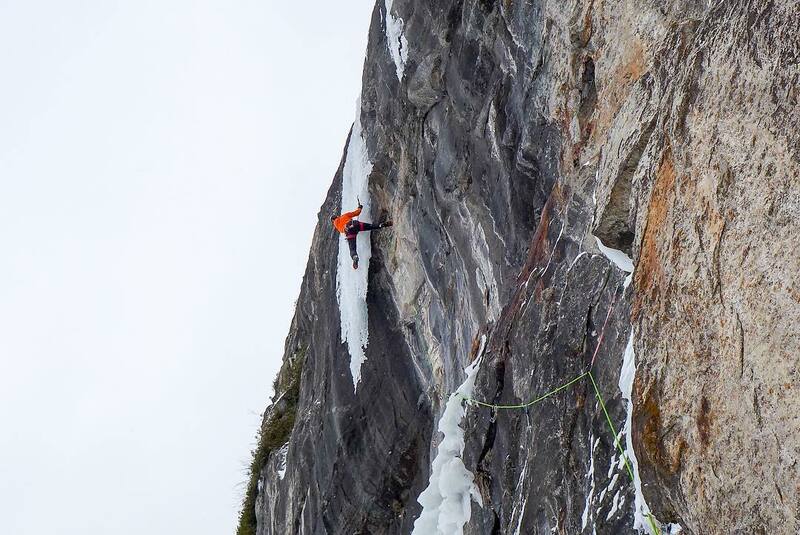 Climber Nolan Huther had suggested Apex Predator. It seemed fitting given the feline theme we often try to pull from. We took a moment for a quick walk south to the top of a knoll. 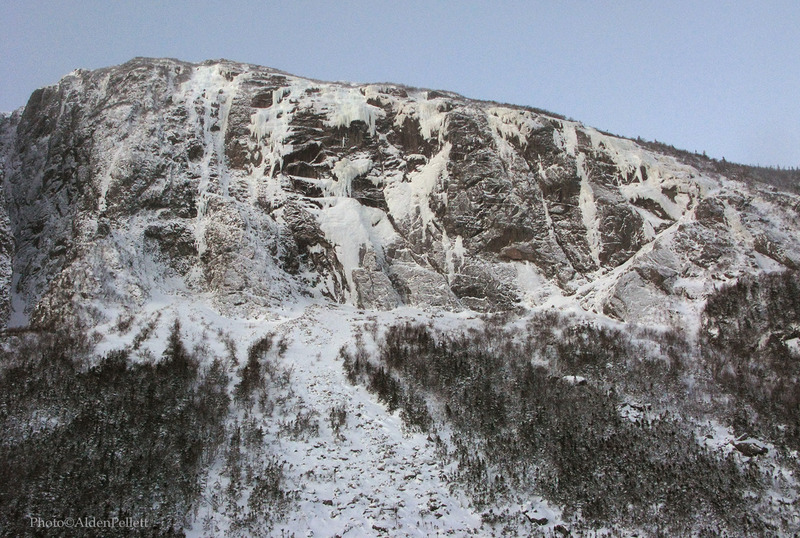 The scenery beyond displayed Marcy’s East Face and several ice lines on its vertical north side. In the obvious gully below, but out of sight, was Grand Central Slide. We rappelled the length of the route from a stout tree set 20 feet back from the cliff top. I slowed down after the terrace and gingerly stepped down the low-angle ice above the initial curtain. I wanted to inspect it. As expected, the sheet was hollow, and I saw fracture lines about 40 feet above the ground. We were wise to avoid poking this particular dragon. We ate lunch in the glade below the cliff, standing amidst a yard sale of gear. Spiritus Draconis beckoned from the south. We discussed climbing the nearby route. 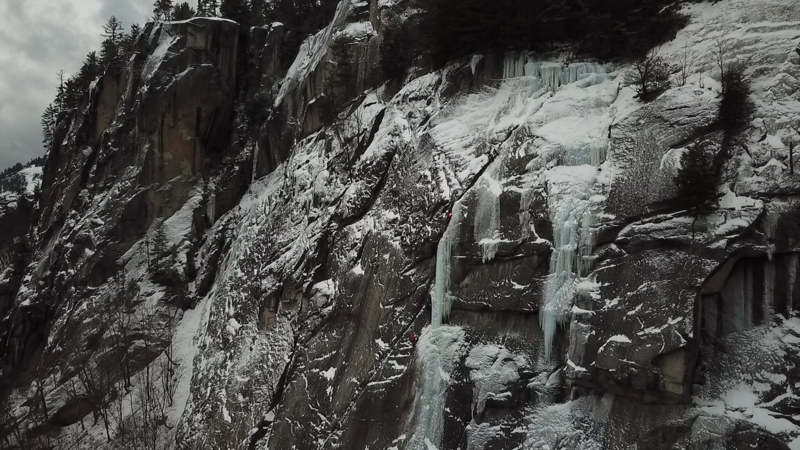 Alan needed a lead, and the route needed a second ascent. Aaron was satisfied with what we’d already accomplished. He relaxed and enjoyed the serenity of Panther Gorge and the majestic views while Alan and I climbed. He picked a line in between the two and, after about 20 minutes, disappeared onto the lower-angled top section and into the woods. I followed as quickly as I could to save time and topped out a few minutes later. We were done by 3:50 p.m. It took less than an hour for this route, especially without the route-finding details. There wasn’t time for another. We wanted to make this an “early” day. Besides, I hoped to reach the trail by dark. We trekked back up to the Chimney Wall’s gully and made the thigh-burning ascent back up to the “rabbit hole.” I looked at the Great Chimney and noted an adjacent line to its north. I hadn’t noticed it in the past—one more for the list. Navigating out of the Gorge was easy if not grueling. The packs felt heavy. Perhaps we were simply wearing down. Multiple breaks to take photos of the glowing crown of Haystack and multi-colored sunset allowed me to catch my breath. The slope eased after 45 minutes which signaled that we would soon enter the grip of the krummholz again. A yell from Alan brought us to a halt. He’d fallen into a spruce trap and was searching the hole for his snowshoe. Meanwhile, the weather changed, and clouds rolled in from the northwest. I watched the summit of Marcy disappear in a gray cloud as the wind increased. Trekking back to the Loj was a matter of putting one foot in front of the other. I was still feeling the inner peace that such a day always elicits. The headlamps lit the fog as I mentally ticked away the benchmarks—Indian Falls, the Phelps summit trail, Marcy Dam, etc. We’d started at 4:45 a.m., and it was only 8:15 p.m. when we reached the trailhead again. A day that’s under 15 ½ hours is below my average. That, in my book, is a good outing and getting on the new line was a prayer answered.